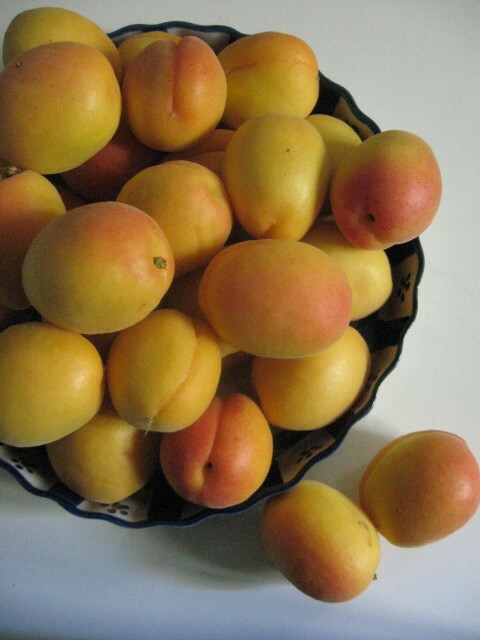 Golden-pink apricots are in season now in the Middle East. Preserve some as chutney for year-round enjoyment. Do you like chutney? Cooking your own seasonal (and preferably organic) fruit, you can enjoy locavore preserves that you won’t find in any supermarket. And you choose the sweetness and chili heat of your chutney according to your own taste. We’re enjoying the short apricot season now. Try this mild chutney, flavored with sweet spices rather than lots of fiery chilis and assertive onions. 4 oz. organic raisins – just under 1 cup. Black raisins make a darker chutney; golden raisins make a light. 1. Rinse, halve, and pit the apricots. 2. Slice the onion and garlic thinly. 3. Put all the ingredients into a large pan. Boil till the apricots are very soft. 4. Remove the apricots from the pan with a slotted spoon and put them into clean, dry jars. 5. Boil the remaining liquid until it becomes a thick syrup. 6. Pour the syrup into the jars; cover and allow to cool before storing. If not using sterile canning procedure, store the chutney in the fridge. It will stay good for up to one year. Rxgs, there was no cumin in the recipe, but I assume you were thinking of the coriander. I’m glad you were adventurous and adjusted the recipe to your inspiration. Thanks for commenting! This was a huge hit at my Mothers day celebration. Served over grilled pork tenderloin. I would add less cumin and add a half a cup of dried apricot halves in addition to the fresh ones. It has a fantastic flavor.